Advertising on THR connects you directly with this audience, at a low cost and brand-safe way, while respecting the privacy of our users. If you are ready to get started, make sure you are logged in and click here. Create your ad. As soon as your ad is approved you will get an e-mail to let you know your invoice is ready. Your ad starts running immediately after payment. Your ad reaches our real, unfiltered audience. You reach our audience at the lowest cost by advertising directly with us. With the third-party ad company eliminated your ads get around more ad blockers as well. Each advertising dollar reaches 51 different people (on average) that we can track. In many cases your reach will be wider as our ad server gets around many ad blocking packages. 53.3% of our visitors come from search engines; the rest are regulars. This means every ad buy includes a solid mix of reach and repetition. You are advertising on the most actively moderated shooting forum on the Internet. You can have confidence that your ad will not appear alongside objectionable material. You can purchase ads by clicking the "Advertising" link at the top of the page to access our self-serve ad system. Banner advertising starts at $250 per month with discounts for ad campaigns 6-12 months in length. We strongly encourage longer-term ad campaigns because of the time it takes to build brand recognition. We display ads in five different places on THR (3 desktop, 2 mobile), so our software requires us to have five different ad packages. We watch performance of these packages carefully and maintain comparable performance between packages by changing the number of ad slots available in each package, so differences in performance between packages are rounding errors. You can create an ad in any package that still has slots available. Choose as many ad packages as required in order to size your ad buy to match your campaign size. If you want to spend $500 per month on advertising on THR, simply create an ad in two packages. When you choose to pay they will all be listed on a single invoice. We recommend that that advertisers buy at least one Desktop and one Mobile ad package so the ad campaign can reach all of our users. Banner code is supported as well. Please note that no advertising goes live until a staff member has approved the ad, and this goes for changes of banners and outgoing links as well. 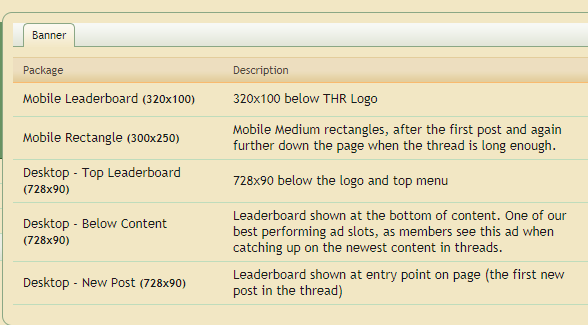 If you want to reach your target audience directly you can buy a 'stickied thread' - a discussion that stays at the top of the relevant sub-forum in order to increase its visibility. These discussions have a purple PROMOTED tag in the title to make it clear to users that this is special content, and will last the length that you specify. Giveaways are an excellent way to increase awareness of your product . We charge a variable fee based on the value of the product or service being given away. We are able to do an independent (and trusted) review of the product that we use as the giveaway description , but advertisers should be aware that we strive to be objective and honest in our reviews. This is our community and no THR staff member will risk their reputation by producing a review that glosses over glaring flaws. With that said, this is a great way to promote a solid product. Advertisers may choose to give out time-limited discount codes participants who didn't win the prize, but this is not required. If you wish to target keywords in multiple areas (for instance, keywords in thread titles and keywords in the first post of a thread) then you will need to purchase multiple ads to do so. This is a limitation of our software. Please note that a given keyword will only be sold to one advertiser at a time. These ads are generally priced on a CPM basis, though CPC is available if we can figure out a reasonable cost per click. With keyword advertising your ad will stop displaying as soon as the ad buy has been consumed. We are unable to predict what the demand will be for a given keyword, so you are encouraged to watch the performance of the ad so it doesn't expire before you expect it to. This is different from banner ads which are displayed for a set period of time. Do you have a big product launch coming up and you'd like THR to help promote it? Are you looking to sell co-branded merchandise? Do you have a great, non-standard idea? Call, e-mail, or contact us on the forum. We would love to talk to you. We believe we offer the best advertising ROI of any media that reaches the shooting community. For more information please start a conversation with Derek Zeanah using the forum, send an e-mail to [email protected], or call Derek during business hours (EST) at (912) 852-4023.